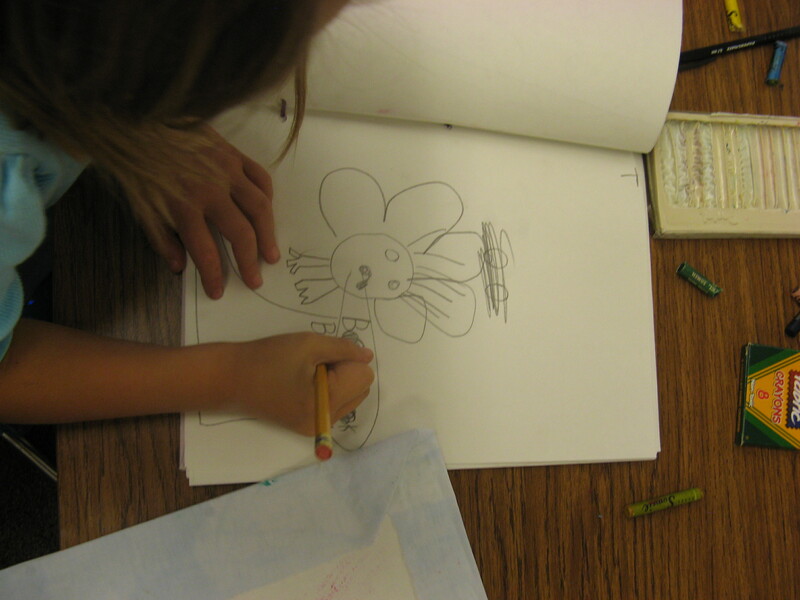 This fall, the students explored the world of imaginary creatures through our first unit. 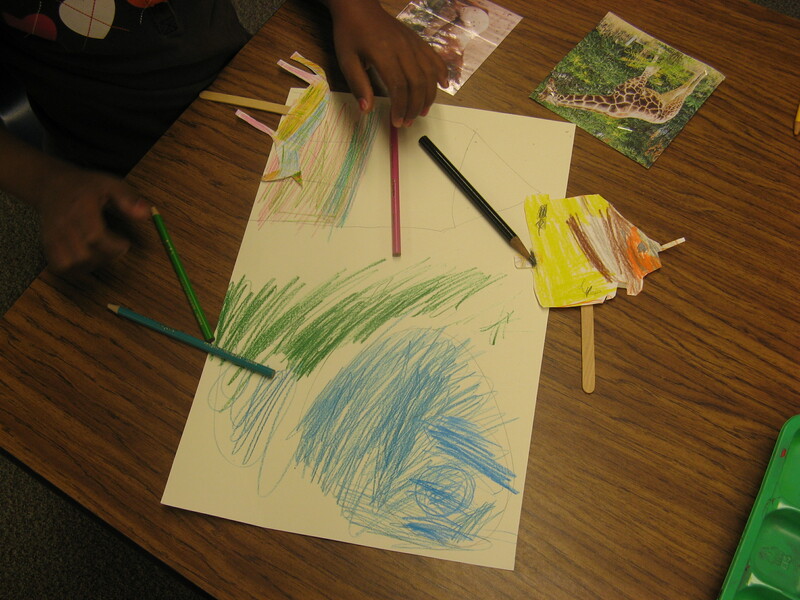 We began this unit by having them paint and draw with watercolor, colored pencils, salt, and tissue paper imaginary creatures. For this lesson, they were to experiment with the materials at hand, and allow the creatures to grow out of these experimentations. 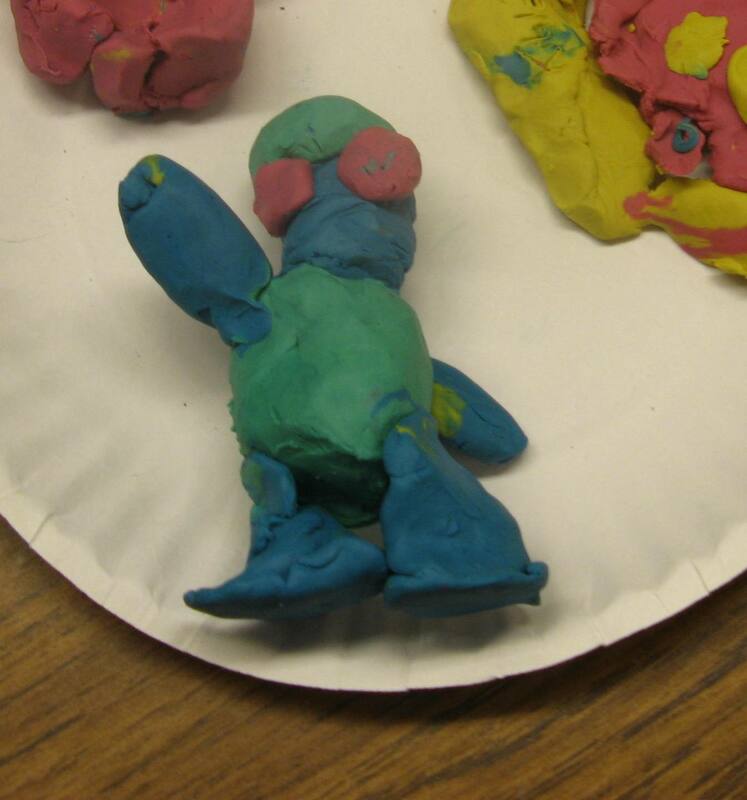 Then for the next lesson, we had them create their creatures out of modeling clay using hand building techniques. For this, they were to capture their creatures’ personality as well as their emotions as they molded their creatures out of clay. 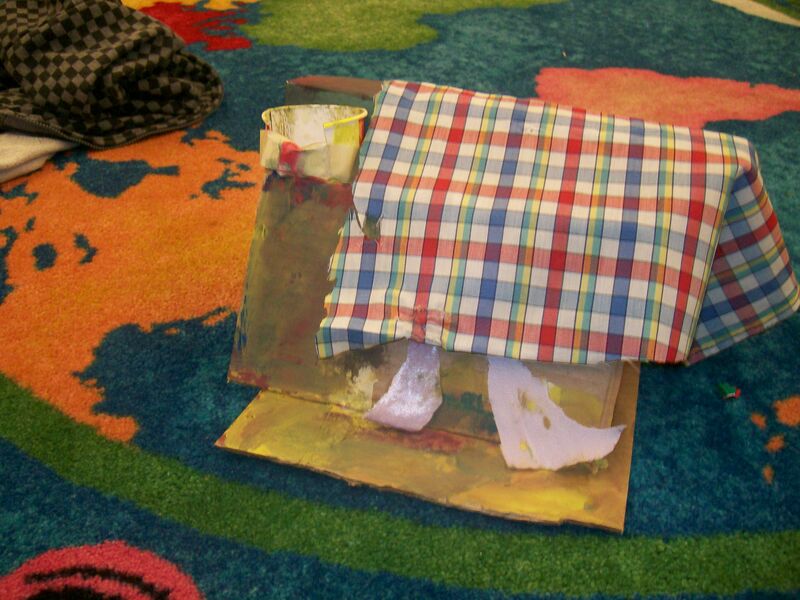 We spent the next two class periods building houses out of recycled objects for their creatures. 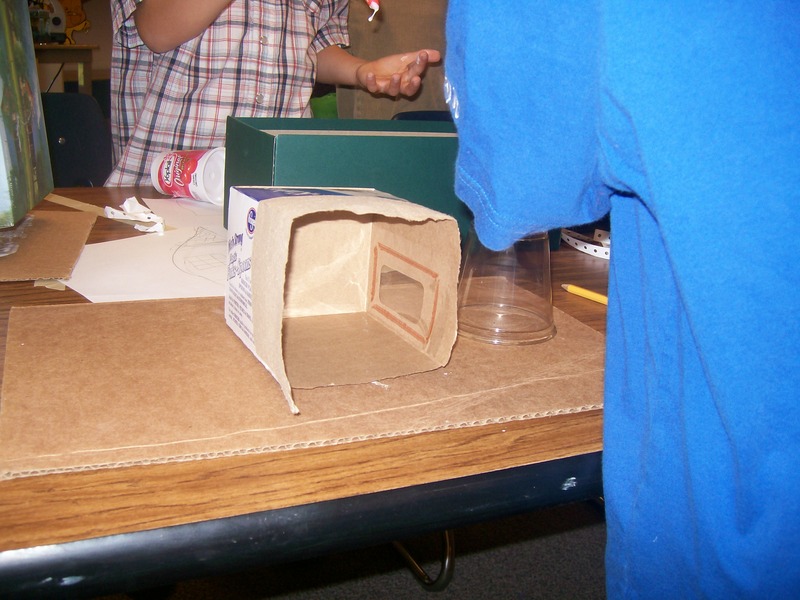 For this lesson, the students had to keep in mind the texture, color, and size of their houses and how these things related to the creatures themselves. Finally, we culminated this unit by creating maps of their creatures’ neighborhoods. The students had to make a map with their peers at their tables and they had to incorporate the main features of maps such as a compass rose, a key, and identifying features for landmarks. 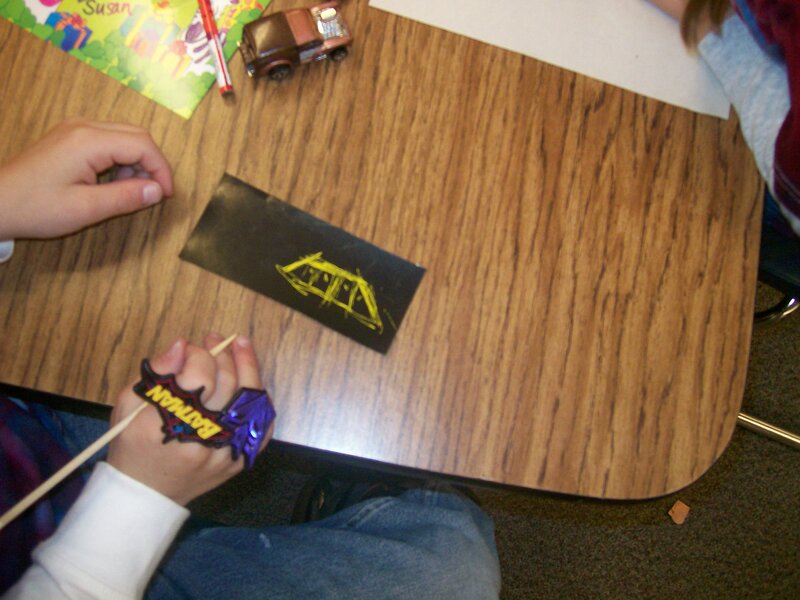 Other lessons that were not apart of the unit that we did this fall were making puppet shows with paper puppets, as well as making sketchbooks, super hero capes, and working with scratch paper. The creature unit was tied into the Colorado State Standards which are simply: create, reflect, transfer, and comprehend. These Standards were incorporated into the lessons as shown in the following chart. Since the Lab school doesn’t really have an art curriculum, this unit was relevant to the student’s art education in that it got the students to think about the same idea (imaginary creatures) while dealing with different media. 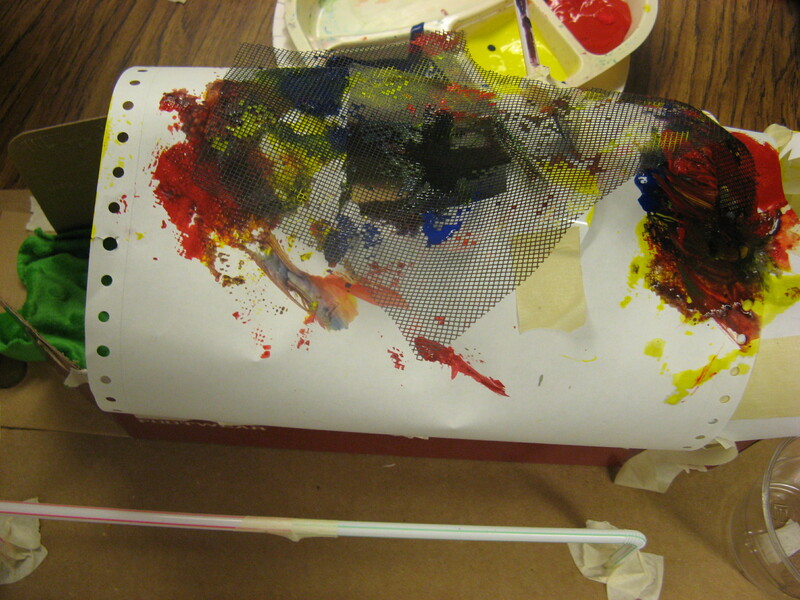 This focused their attention to one idea while using a wide variety of media and techniques. 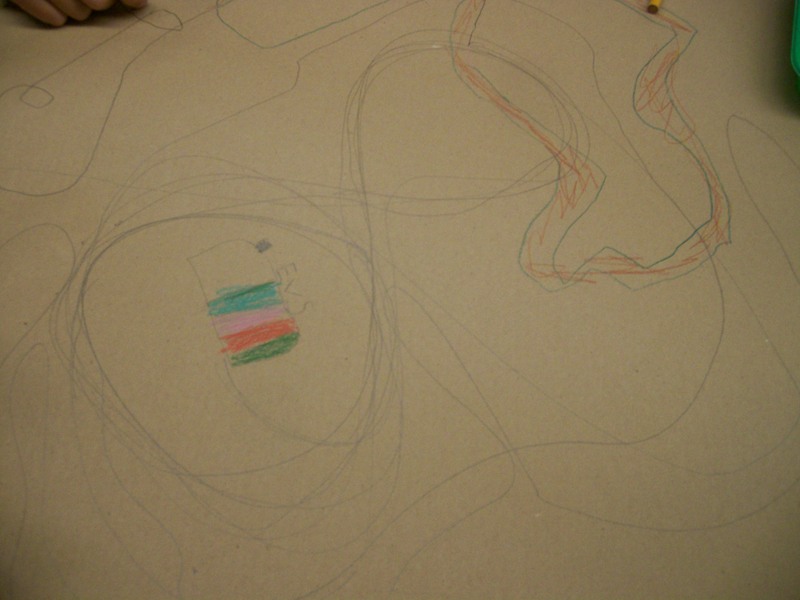 Furthermore, the map lesson dealt with cross curriculum learning because the students were studying maps in their other classes, and they were able to make their own imaginative maps using the ideas and lessons they learned in their other classes. 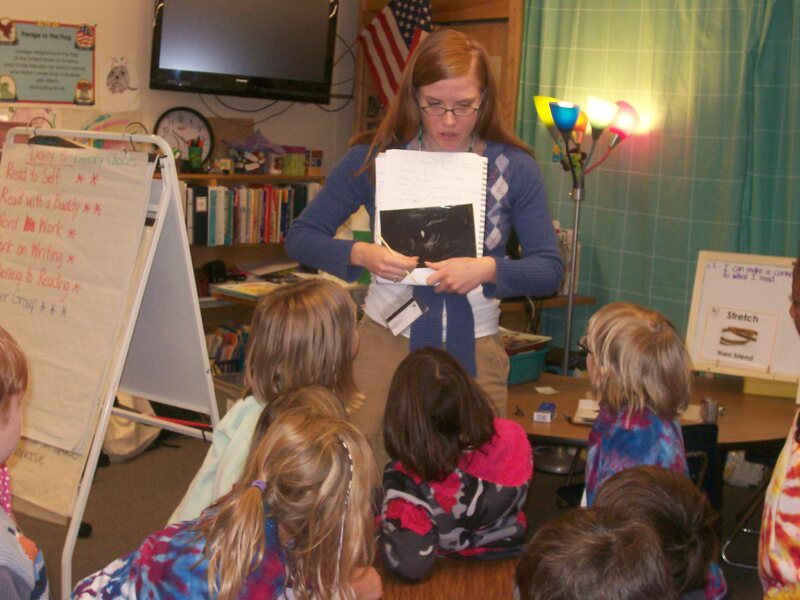 This unit was significant for the students lives in the following ways: globally, and for this class as a group. 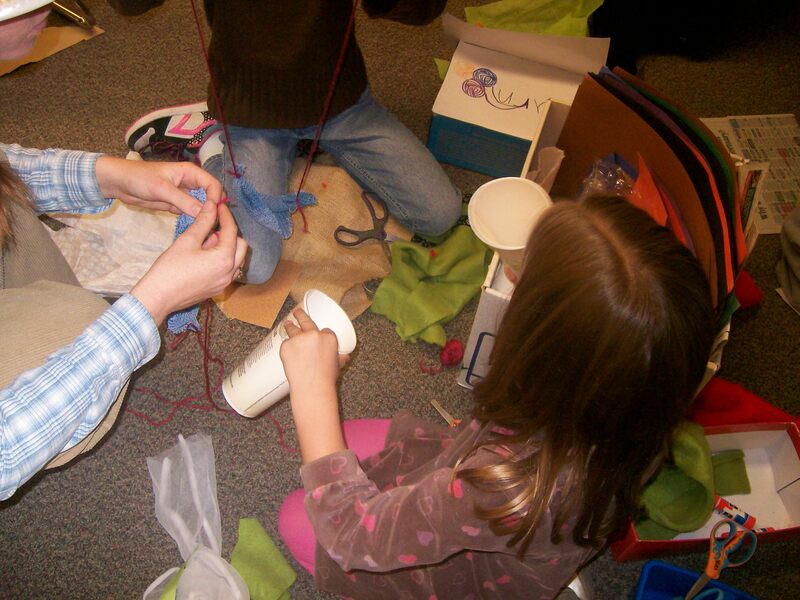 This unit was globally significant because it encouraged the students to grow in their creativity, and explore an imaginative realm of their own creation. This is an important skill to have in a world that is constantly changing and where imagination and critical thinking are important and valuable skills to have in order to keep stride in this fast pace world. 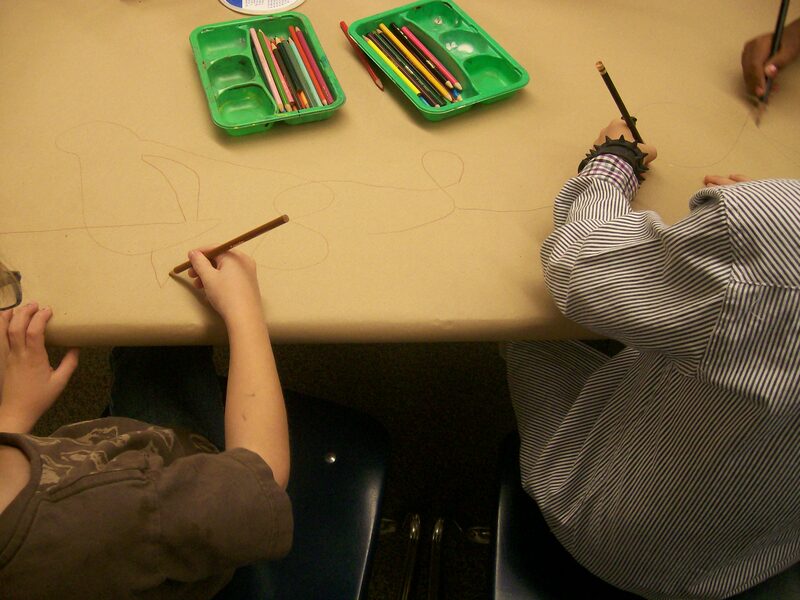 This lesson was significant for the students because I watched many of the students who were timid and afraid to try in art, branch out and gain much more confidence in their artwork. The students exhibited much enthusiasm and pride for their artwork, and they showed great imagination and creativity as they talked about their creatures, and their creatures’ homes and neighborhoods. Creatures' neighborhoods in the art show with some clay creatures, houses, and a neighborhood map. This fall, Anna and I really enjoyed working with your students, and we will miss working with them. I hope they enjoyed it as much as we did. For this class period, we began by talking about sketchbooks and what artist use them for such as sketches, writing, saving founds objects in them, etc. We then looked at pictures from famous artists who used sketchbooks as well as my sketchbook to see the wide range of material that can be put into a sketch book. I then gave the students sketchbooks of their very own, and they got right to work. They decorated the covers with their names, and with things that they were interested in such as their favorite food, color, etc. 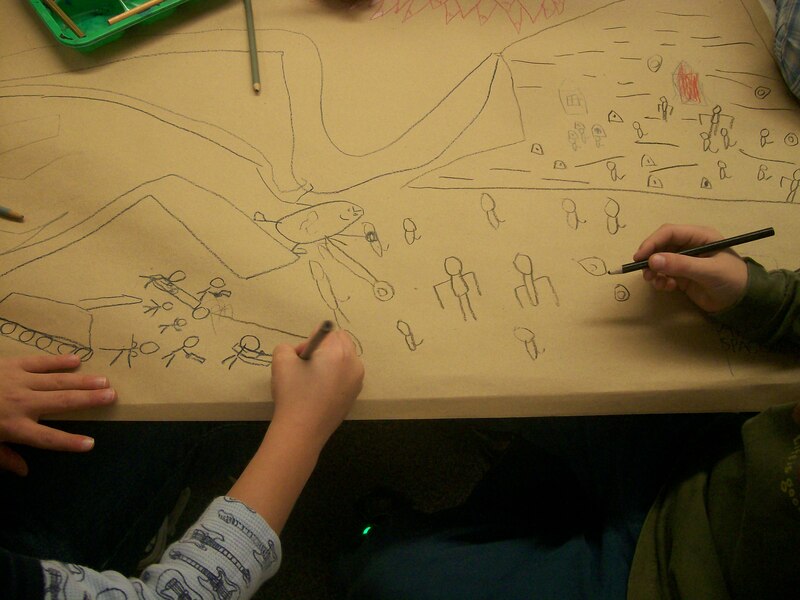 Once they were done with this, the students were to draw superheroes in their sketchbooks. Not all students did superheroes, however, because it may not have fit into the theme of their book and that was quite all right. 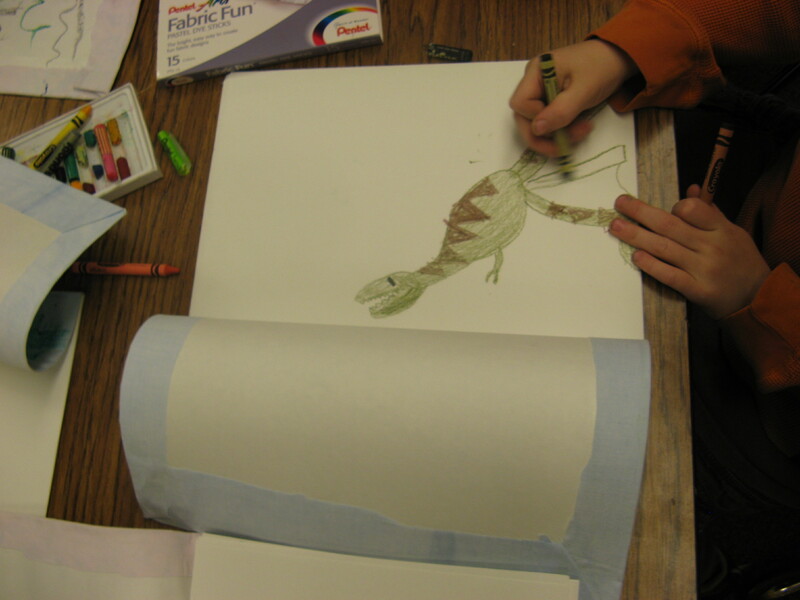 For example, one student made his sketchbook into a dino field guide, and a superhero wouldn’t fit into that category. 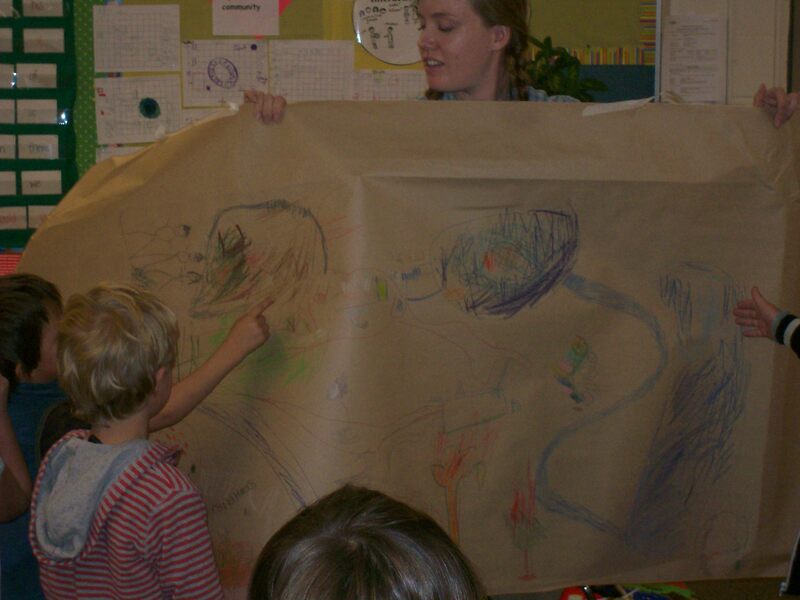 He did, however, pretend that the dinosaur he was drawing was a superhero and that his tail could be used as a superhero cape. After they worked, on their super heroes, (and some students before) the students worked on a wide range of drawings from their imaginations. They drew pictures of everything from what they did this summer to their favorite animal to writing their friends’ names on their sketchbooks to a book of monsters. The cover for the book of monsters. 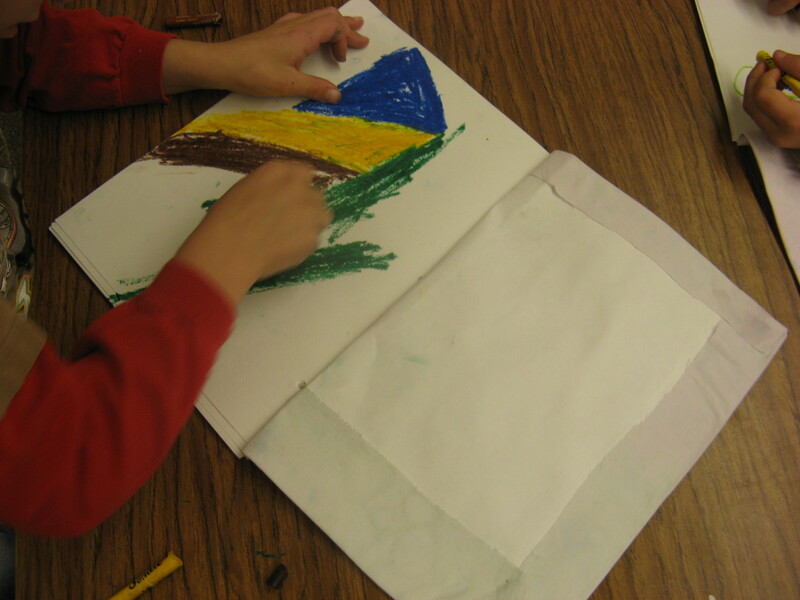 A student drawing large blocks of color in his sketch book. 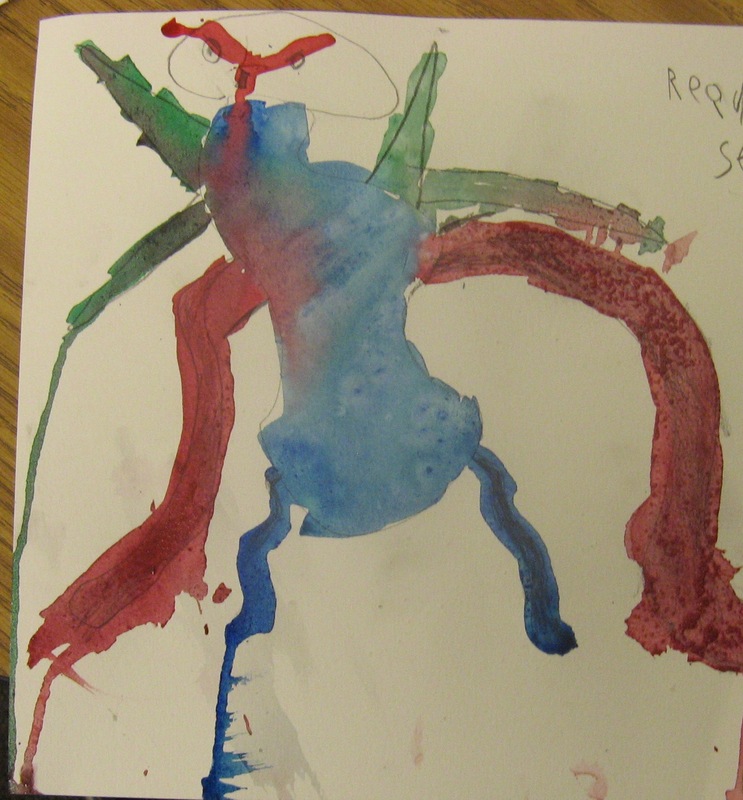 A student drawing himself skateboarding. It was really interesting to see how some students “played” with their drawings and made up stories as they worked on them. It was as if they were playing with a toy and developing a story with that toy, but instead of a toy, they had a drawing that they were working on as they made up the story. Another student made the noises her drawing would make if it was a real live creature. A student writting the words as she made the sounds they make. 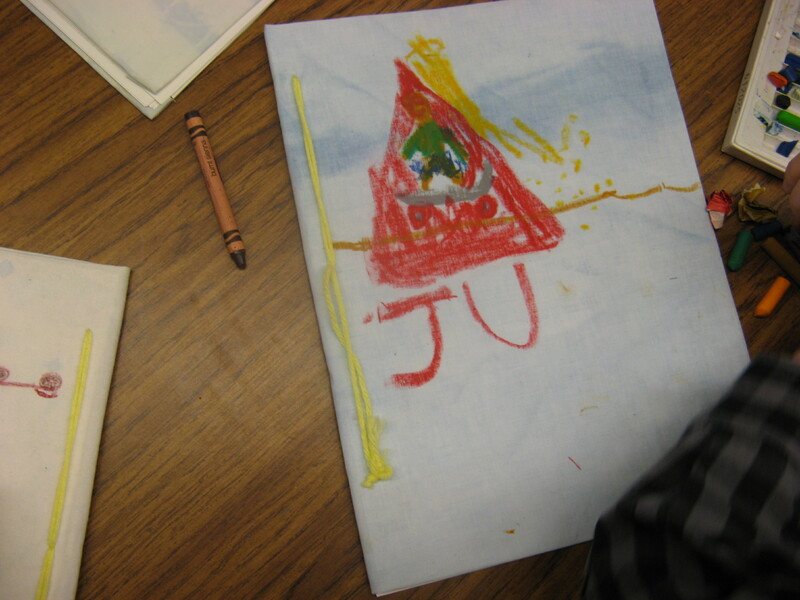 After the student’s were done with working on the sketch books, I handed out superhero capes, and the students decorated these capes that showed who they were as superheroes. They were then able to take these capes outside to play with them at recess if they wanted. At the very end of the class, we gathered together on the rug, and talked about our superheroes/supervillains and we talked about what makes them super and what their favorite color was. 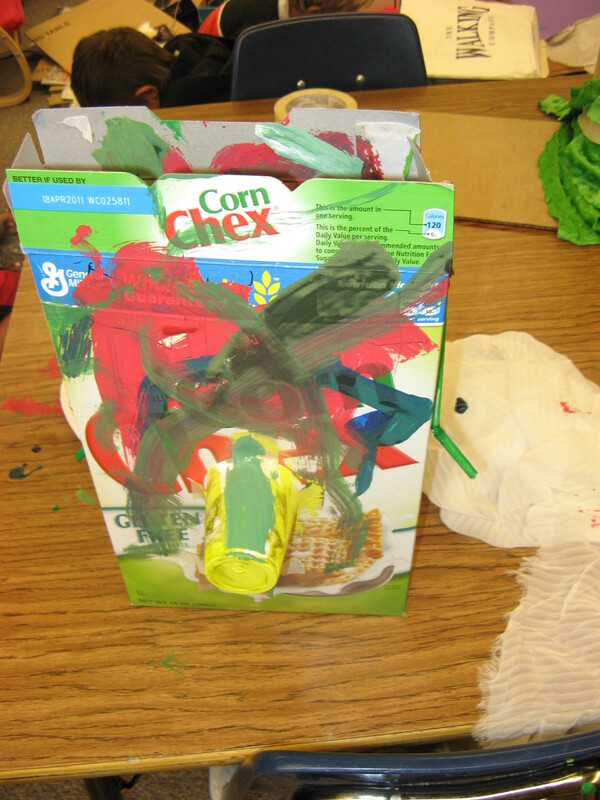 Puppet Shows and Scratch Boards! This week we finished up our puppet shows and then Cory introduced a new lesson. It was an exciting day for the kids because before art class they got to eat cupcakes in celebration of one of the student’s birthdays. They also had a field trip later that day. Needless to say, the energy level in the classroom was very high! We began with three more puppet shows. The kids listened and laughed while they watched each other perform. After a few puppet shows Cory introduced scratch boards. 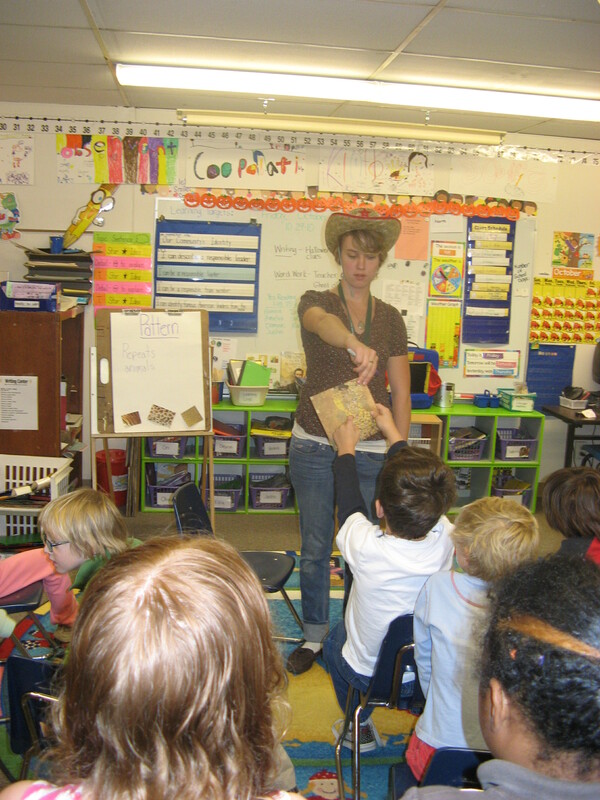 She began by going over the concepts behind pattern once more with the kids. They had a really good grasp on places they could find patterns. They looked around the room and pointed out several examples of patterns. Then Cory did a short demo showing the students how scratchboard works. 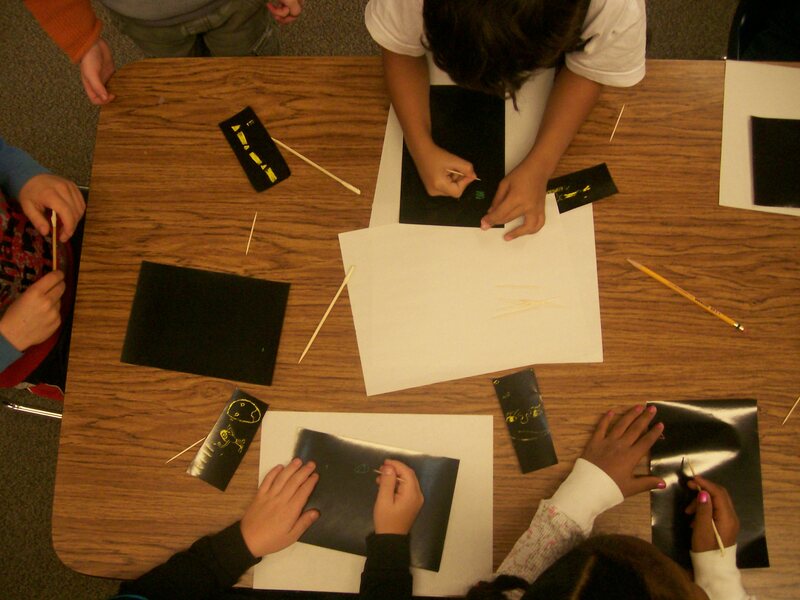 Most of the students already had experience with scratch board and were eager to get started. The assignment was that the kids had to make a self portrait on their scratchboard using pattern. Cory showed them several examples of what that might look like. 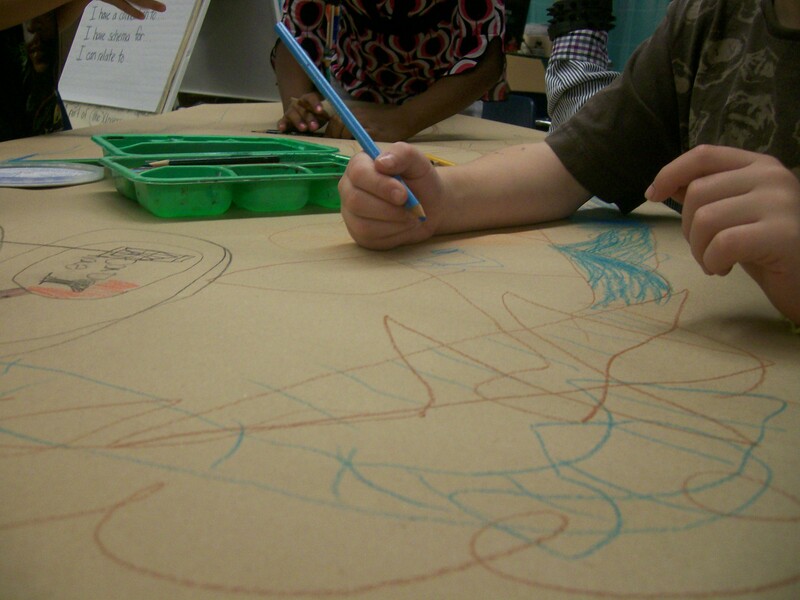 Before they could get their scratch board they had to sketch out patterns and ideas on newsprint. 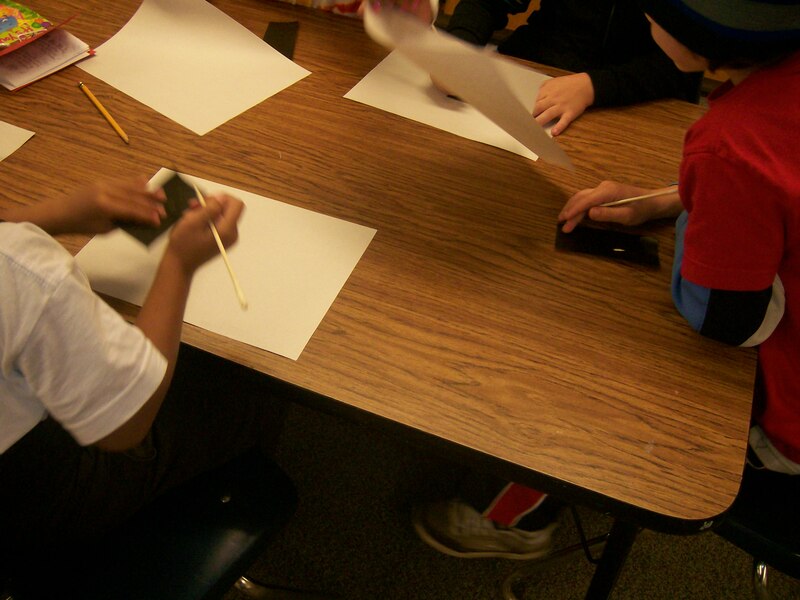 Once they were done sketching they received small strips of scratch board to experiment on. They really loved working on this paper. They liked to experiment and see what kind of different marks they could get by different scratching techniques. 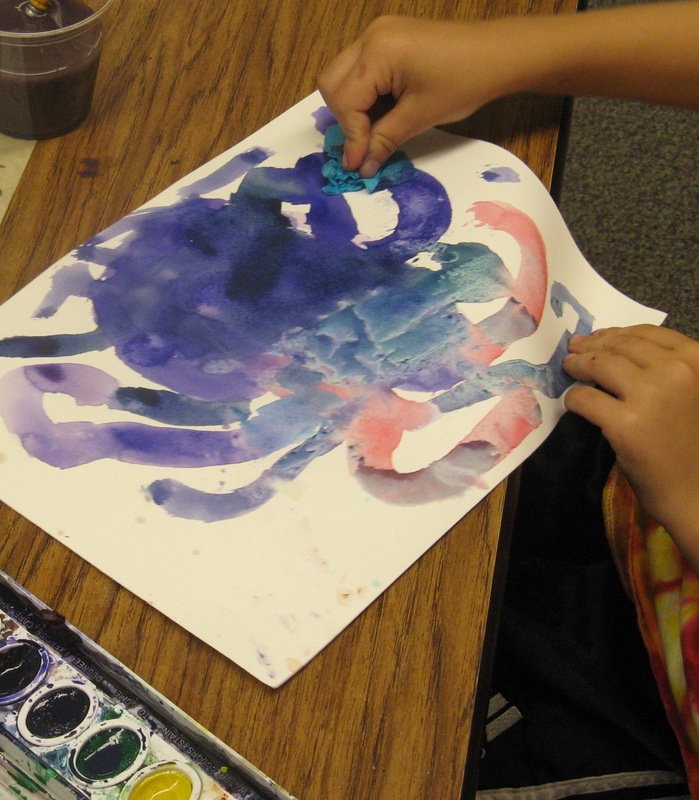 Some students would build up light marks to make their shapes and patterns while others would scratch hard into the paper to get big blocks of color. 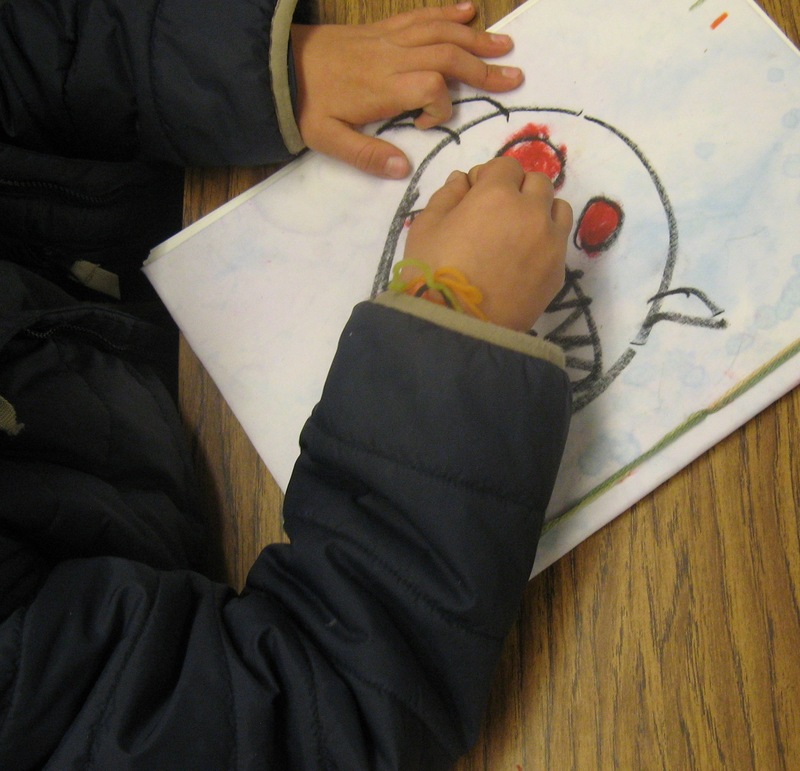 Once they had experimented thoroughly the students completed their final self portraits. They carefully chose what color paper they wanted. Working on the scratch board was a challenge to some students because they found out that they could not erase their marks as they may be able with normal pencil and paper. Many did well to overcome this challenge by incorporating their “mistakes” into their patterns. 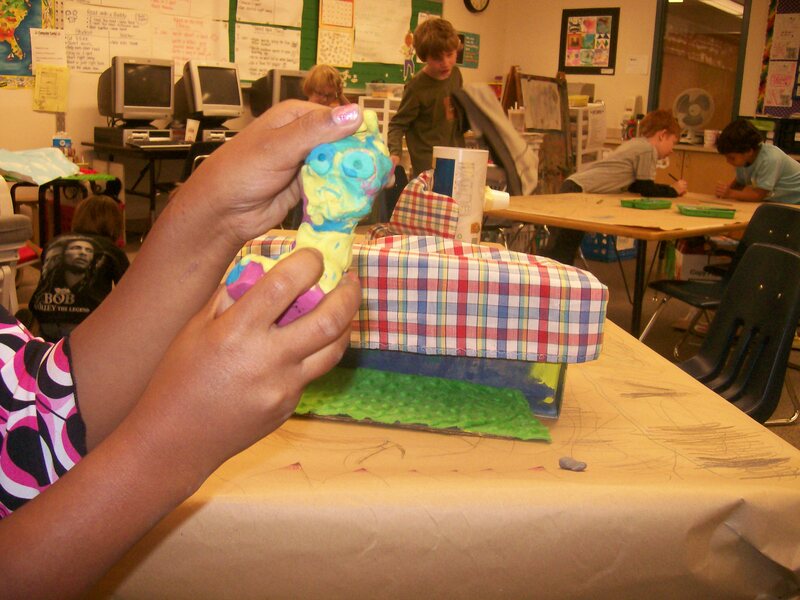 Once the self portraits were done, the students finished up their puppet shows, and the class came to an end. Today we continued our puppet show lesson. The students had to re-iterate what a pattern is and what their stories were about. They were excited to begin working on them. I dismissed them to the tables and handed out the puppets and backgrounds and they got right to work. I was surprised at how focused and quiet everyone was. I wasn’t sure how long it would take to finish up this lesson so I had the next one ready to go, but to my surprise they worked on their puppet shows for the entire class! One group finished early so I had them rehearse their play. 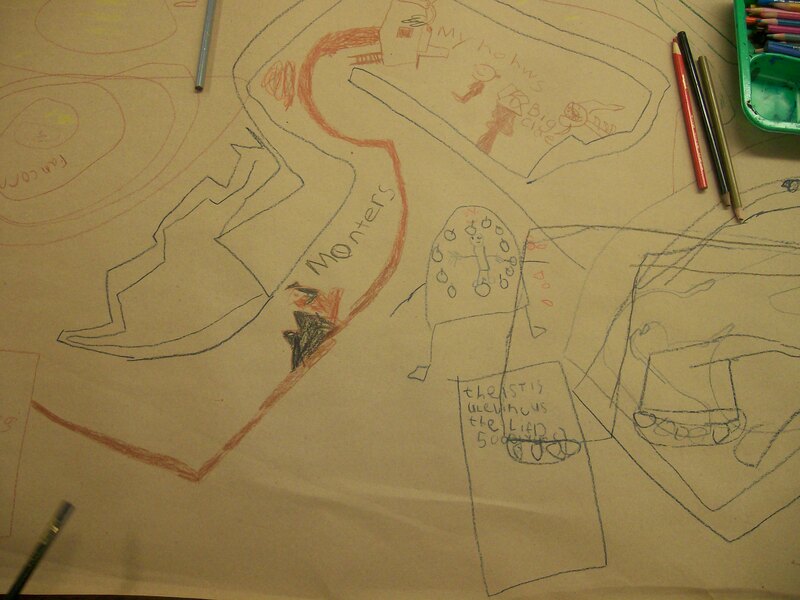 Once the other students saw that group rehearsing they wanted to be done drawing their setting so they could rehearse. I’d ask them if their setting and story was done, and most would reply, “no” and then decide they wanted to have that done before they went on to rehearsing. 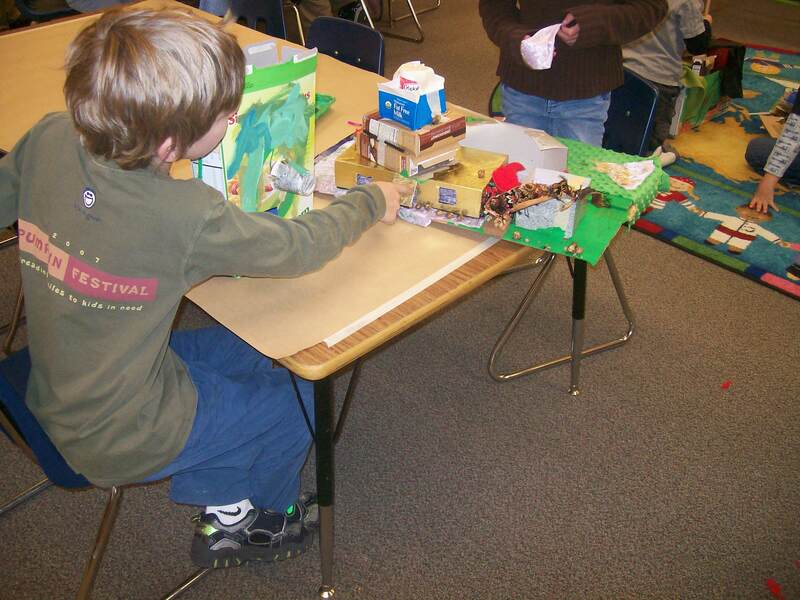 Once most students seemed done or nearly done with their puppet shows (I honestly think some of the groups would never be “done” because they were having so much fun thinking of ideas for their puppets and settings) we cleaned up and the first group got to perform their show. Everyone was very attentive during the show. Before we knew it, it was time for recess. The rest of the groups will perform their shows next week. 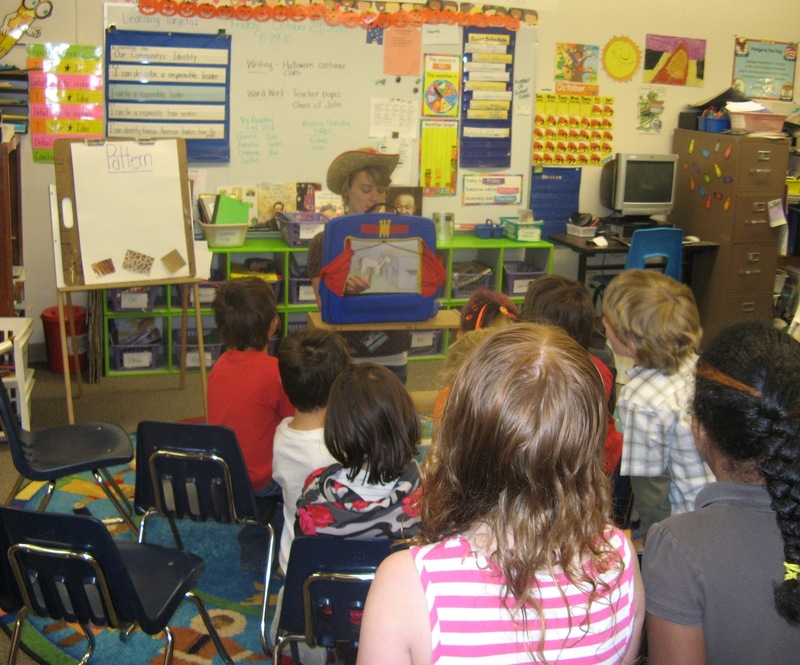 The students began class by watching Anna do a puppet show about a beautiful white horse who had paint dropped on him as he was running away from some townspeople who wanted to capture him so he was no longer pure white but rather had zebra strips. Anna, then talked about how different artist have used pattern in their artwork to create a certain effect. 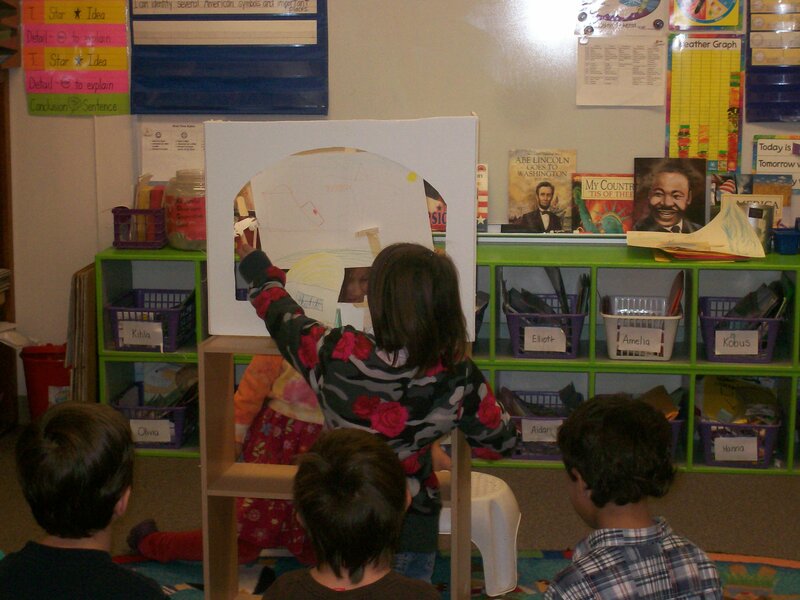 Anna giving her puppet show to the class. Anna and the students finding pattern in Gustav Klimt's work. 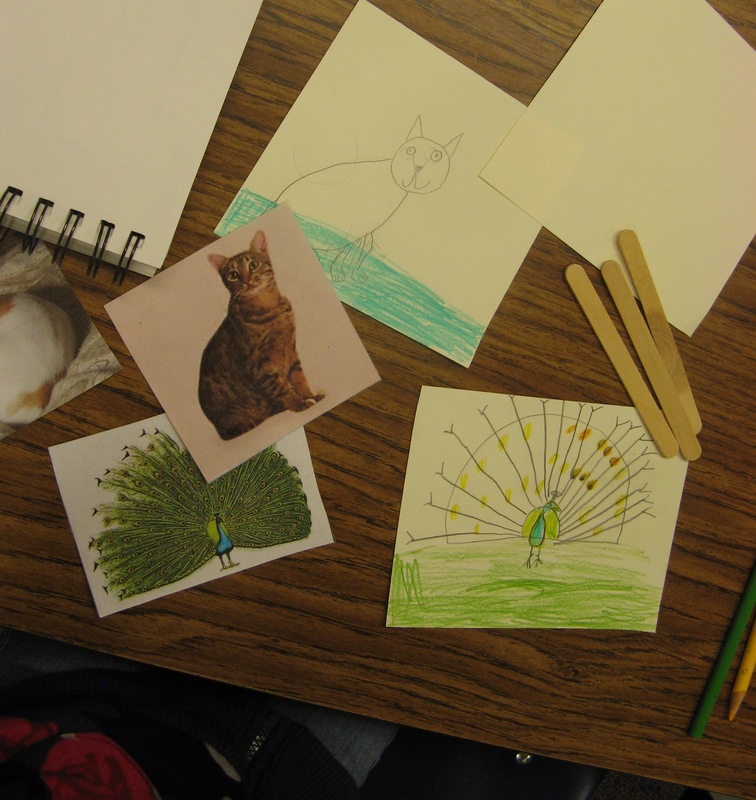 Then, the students chose pictures of animals that they wanted to draw for their own puppet shows depicting how animals got their patterns or prints on their fur, skin, or feathers. 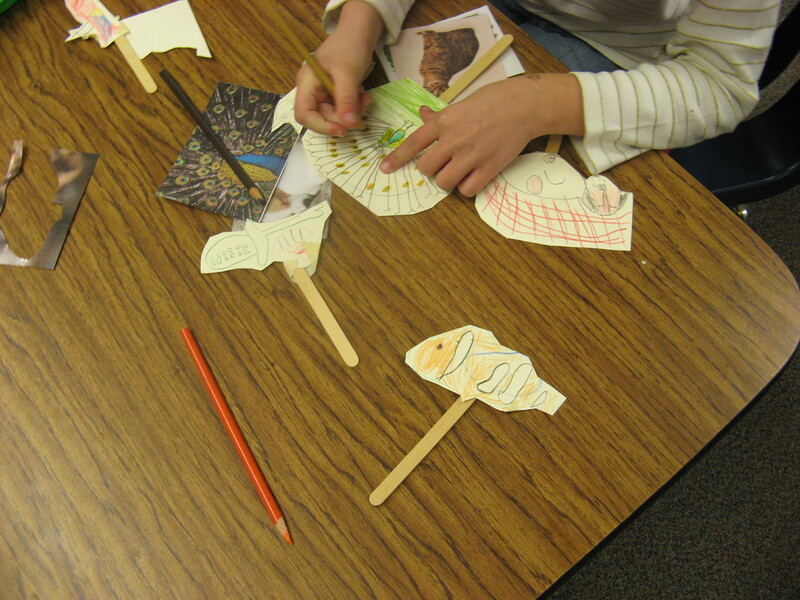 The students will eventually do these puppet shows with a partner, but for now they were making their own animal puppets by drawing them out on paper and then pasting these animals onto popsicle sticks. 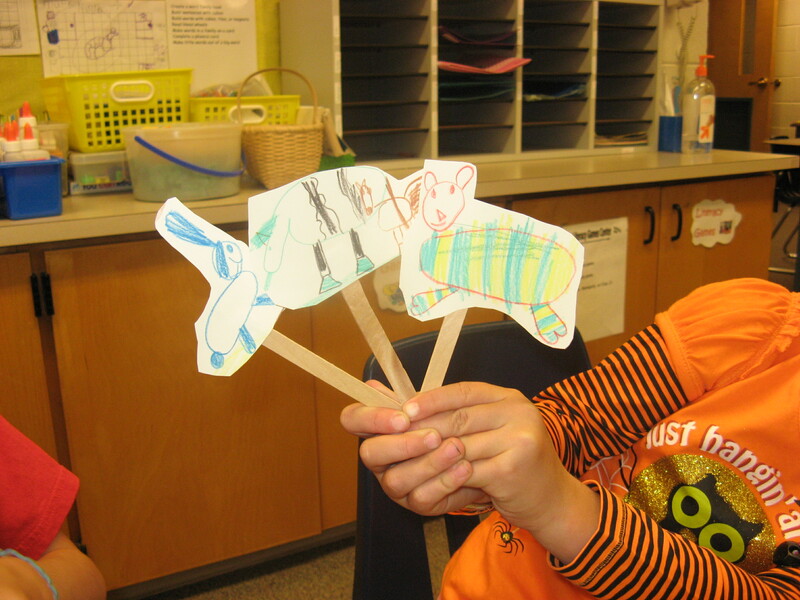 At this point, Anna helped the students break their animals into general shapes so that they would be easier to draw. 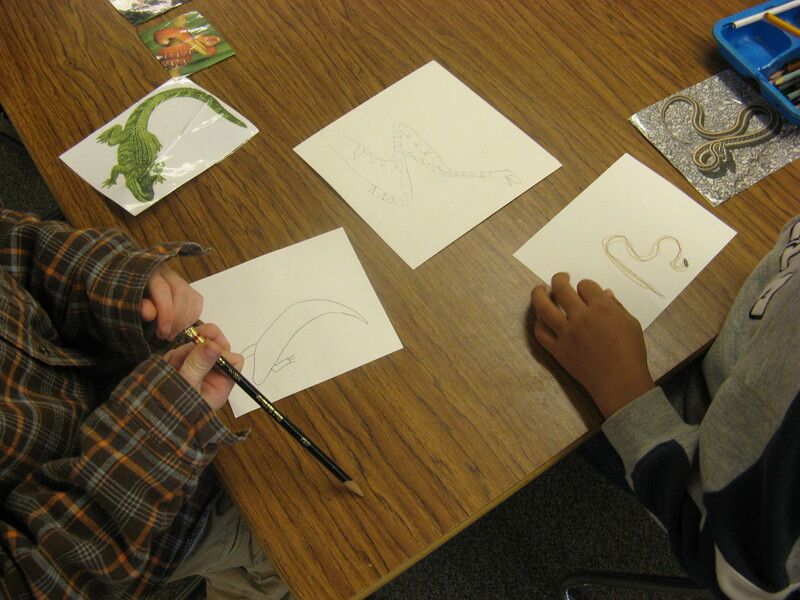 Two students working on their animals. The students also helped each other think about the pattern and texture found within their animals. 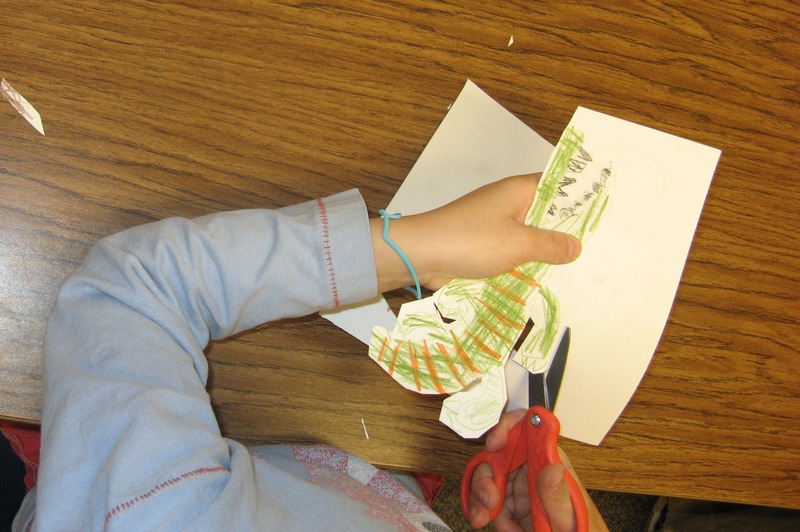 For example, when asked why he chose the texture/pattern scissors, he said that he “didn’t really have a reason,” but one of his classmates chimed in that it was the texture of his animal’s fur. The first student whose animal it was then commented on how his animal’s ears moved independently of one another because he cut them apart, and then he did the same thing with his animals legs so that it looked like it could walk. 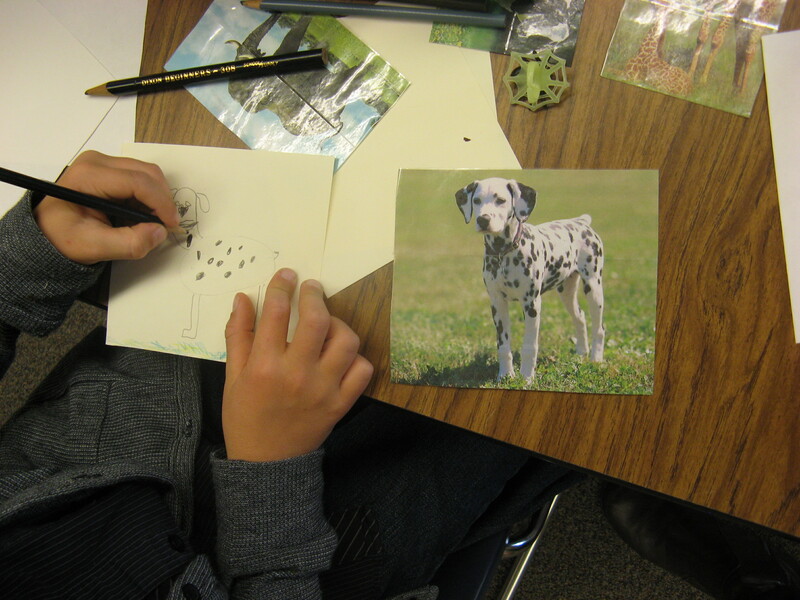 Other students really embraced the idea of making up stories of how their animals got their patterns. For example, two students developed a story that combined how their animals got their color. One student’s animal was a unicorn that became colorful when he leaned up against a colorful shed with wet paint, and then the other student’s animal which was a fish became colorful when the unicorn tried to wash himself off in the lake that fish lived in. The unicorn, and fish with the backdrop for their puppet show. Other students hadn’t decided what their stories would be yet, but they still told me about the patterns that their animals had on them. One student told me about the strips on his fish by describing the color on it and using repetition of words to indicated the pattern: “yellow, white, yellow, white, yellow, white”as he pointed out these different colors on his fish. Another student told me how her bird was colorful because it was colored by the sun. The yellow and white fish with other animals. Colorful bird and a zebra in process. 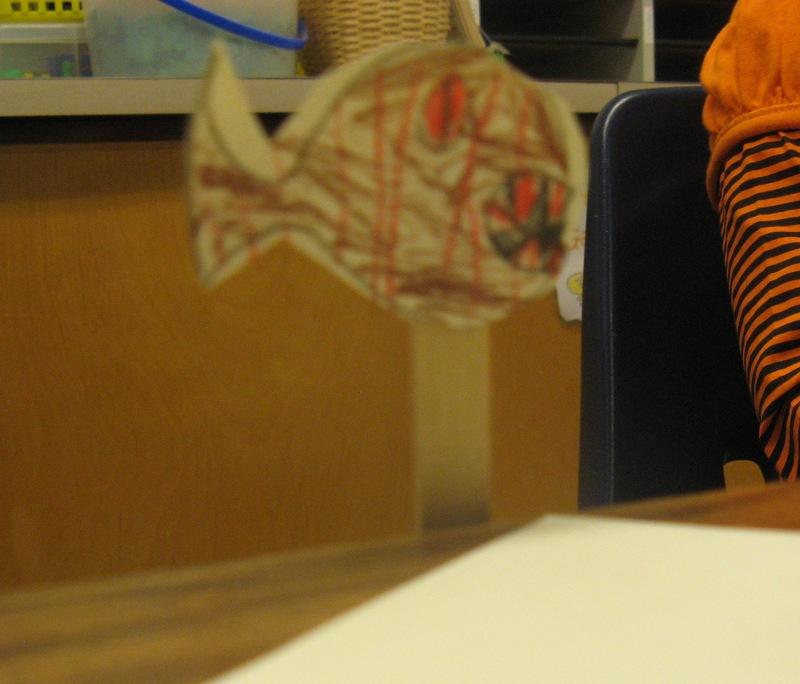 The students were actively engaged with puppet by pretending to move them around on their popsicle sticks as if they were using them in a puppet show, and holding them up so that their peers and the teachers could see them. 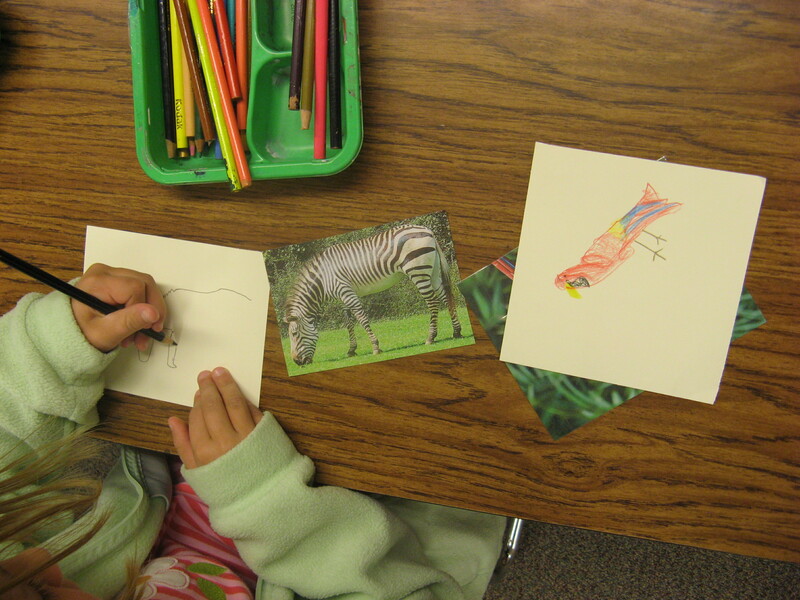 All of the students put a lot of thought into how their animals got their patterns and colors. I am very excited to see their puppet shows. 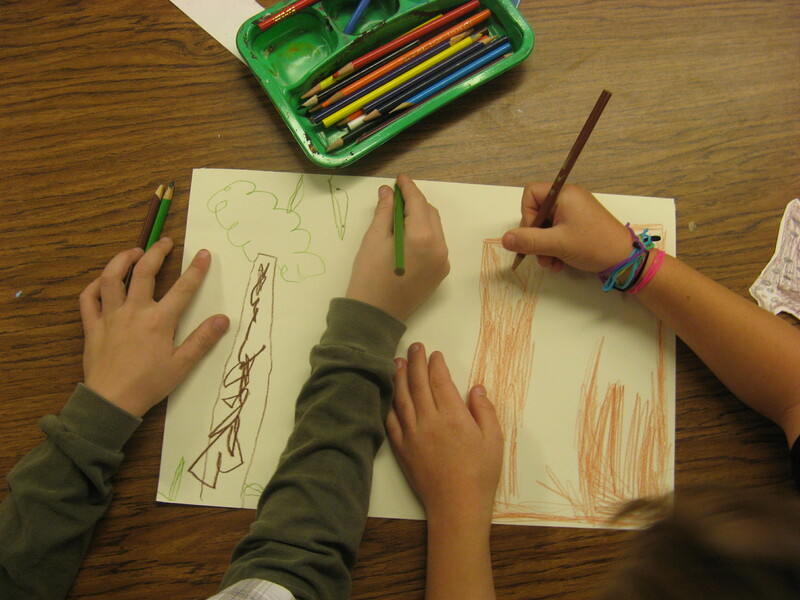 Two students working on the backdrop for their puppet show. This Friday began with a follow up to the completion of the students’ houses. They had to pretend to be real estate agents who were selling costumers on their homes. The students were really excited to be able to show their peers all of the great features of their houses. Next, Cory took the kids on an adventure through Happy Hollow. They had to help her navigate through her map to make her way . They were very good at giving directions until they figured out that if they told her the wrong direction she may wind up in a bear cave! Some students thought the bears sounded dangerous and exciting while others wanted Cory to make it to her friend’s home. 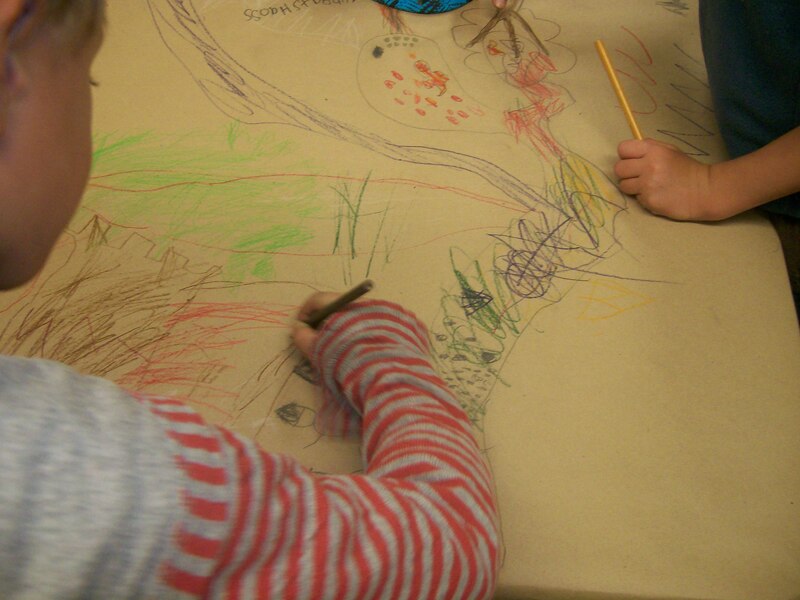 After this adventure the students were dismissed to their tables to make their very own maps of where their creatures live. Some students started by drawing their houses on the maps. 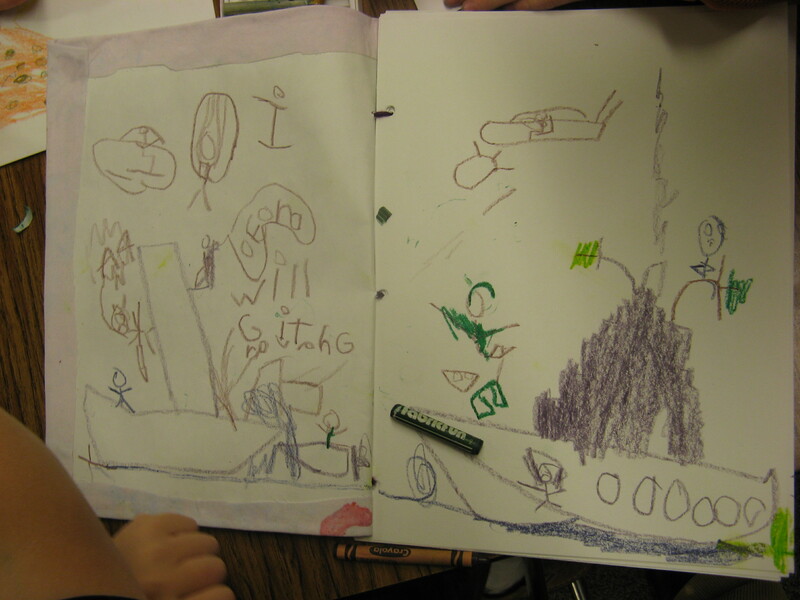 Many payed special attention to put details from their house into the drawing. One student made sure her drawing matched the pattern of the fabric on her house. Once students established their houses they began to fill in their yards and the fill the surrounding space with stores, lakes, gardens, trees etc. One student decided he would have a ghost town filled with ghosts that kept out intruders, but made sure to tell us that visitors were very welcome in the town. 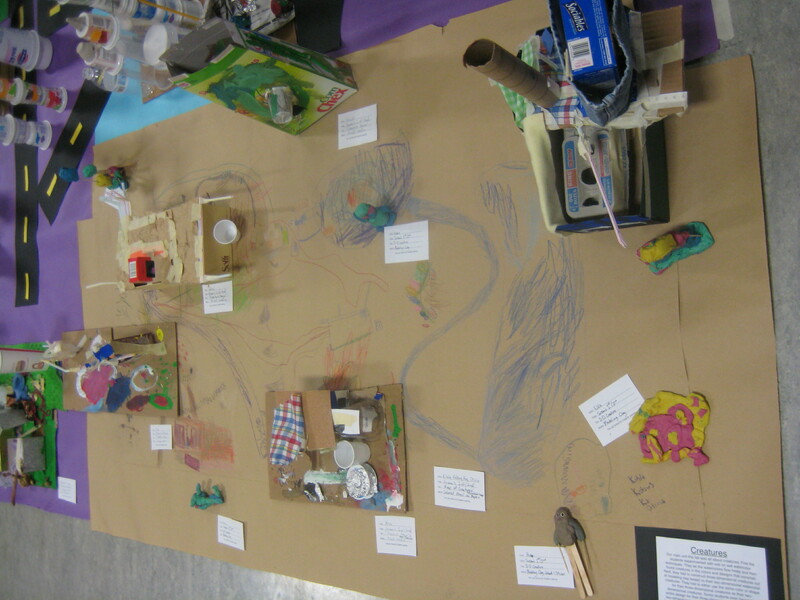 Soon the students began to figure out how to make their spaces interact with one another. Some welcomed their neighbors and drew roads to let in friends. Others built up force fields and gates to protect their homes. Two students actually had a full out war between their two lands. They built up armies and protection from one another. They were completely engaged during the lesson in trying to figure out how to keep one another out of their land. They did this while remaining good-natured and having fun with each other. Once the maps were complete, the student were allowed to finish their homes if they needed to. 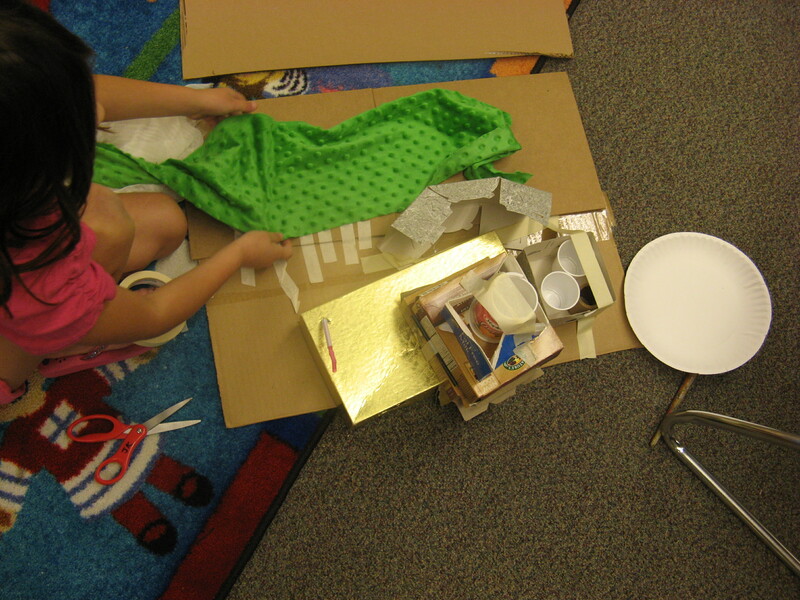 They put the finishing touches on their homes adding fabric and more texture. 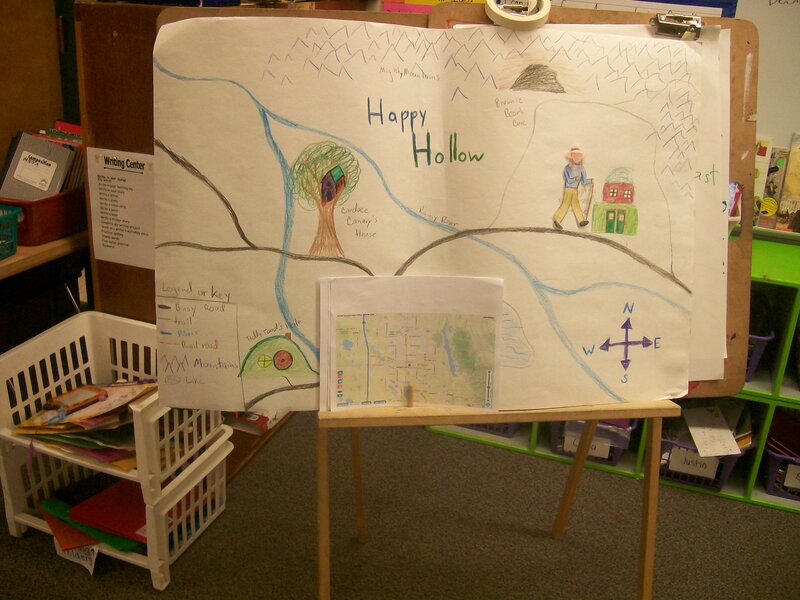 At the end of class, the students were able to tell the class about their maps. Each student pointed out where their houses were and their favorite parts of the map. On Friday, we began class by talking a little bit about texture. On the previous week, I had brought in a list of three things (color, texture, and size) that I wanted the students to think about as they worked on their houses. 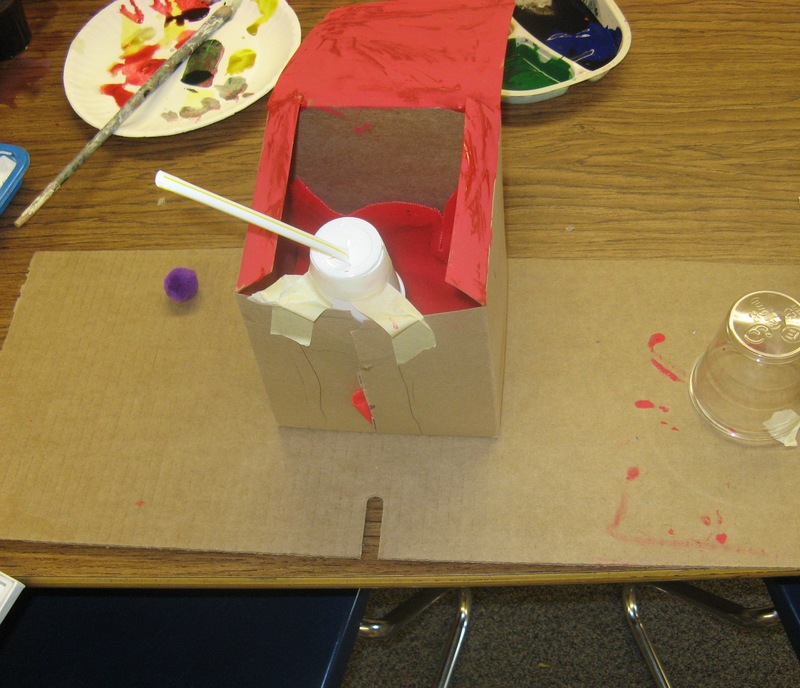 I wanted the class to explore texture a little bit more so I brought in three paper bags that held different materials, and I had three students feel inside the bags and describe what they felt. They described the textures quite well by using words such as “soft,” “fuzzy,” “bumpy,” “pointy,” “rocky,” and “papery.” After this we talked a little bit about how textures can make you feel welcome or ward of enemies. 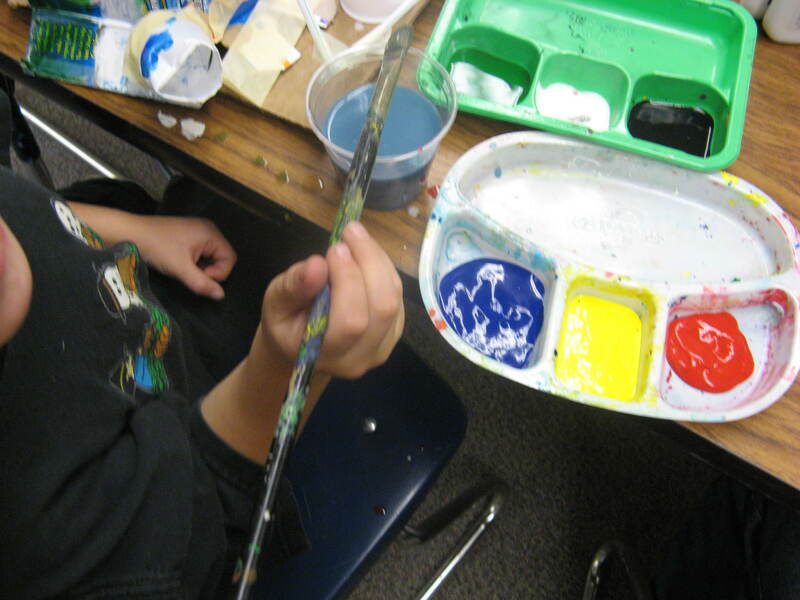 Color mixing was still a vehicle for exploration. For example, one student described to me what colors he used to make gray, and then when he added blue it turned into a blueish color. He was very intrigued and excited about this. Color also played an important role in another student’s house. Her creature really liked the color red so the interior of her house was covered with red painted walls and a red fuzzy cloth for carpet. 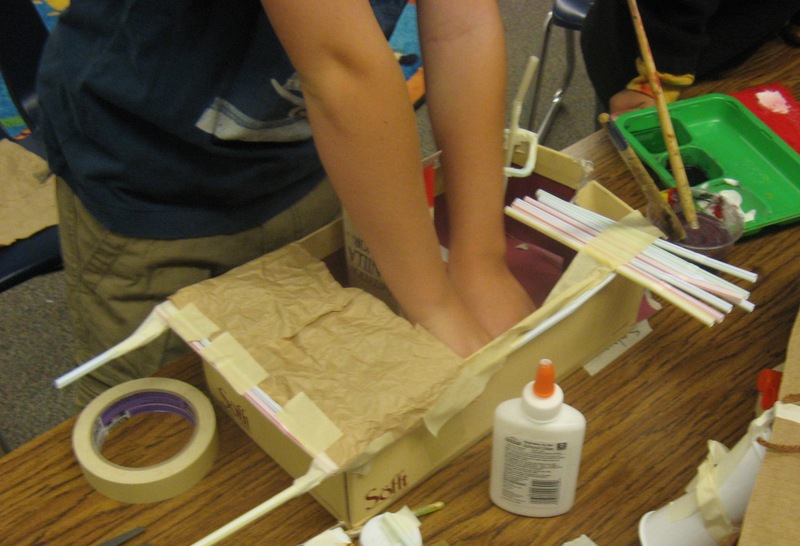 Another student covered his space ship house with green paint, and he described it as being a “slimy green color” because his house was covered in slime. 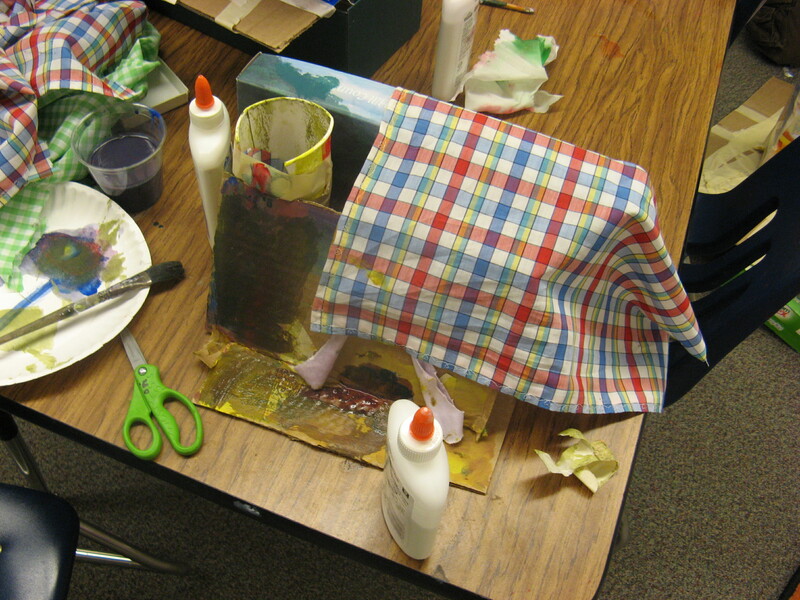 The students incorporated texture into their houses in several ways. 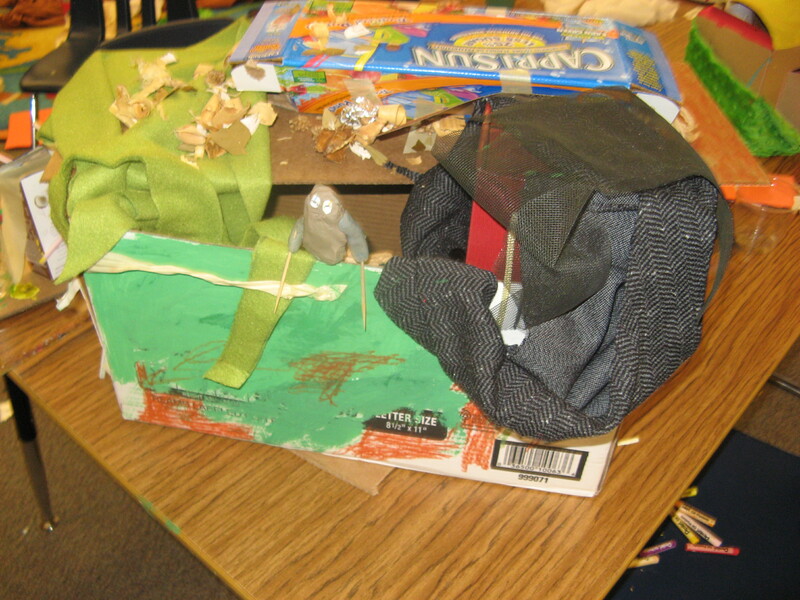 One student took the fuzzy green cloth, and covered the area around her house with it. She said it looked like grass “because it is fuzzy and green with the little bumps on it.” Another boy used the crinkled up brown paper bag as a roof for his house because he thought the texture looked like a roof. Another student used a piece of wire mesh as a trap door cover in case invaders crawled on his roof; they would then fall into the trap and not be able to escape. 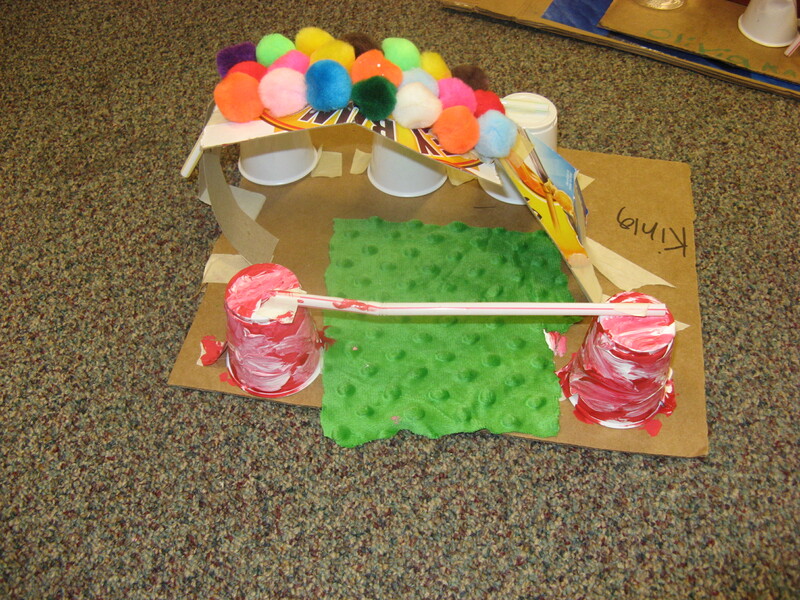 All in all, I was very excited to see the wide variety of materials and colors being used in the creative houses.